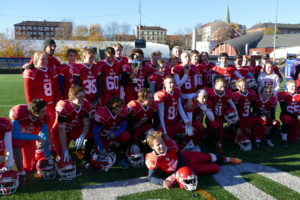 Oslo Vikings U15 team did what was needed and then some, in order to secure the Norwegian National Championship 2016. It was crisp but sunny as the team faced a capable Åsane Seahawks in the season finale. The stage was set; with a win the Vikings would win the national championship, with a loss the title would go to arch rival VIF Trolls. 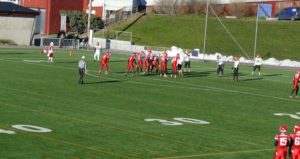 Ironically the game was played at Jordal stadium, the home field of the Trolls, since the Vikings home field at Frogner Stadium was closed for the season. ball was chased down and recovered by the defense on the Seahawks 10 yard line, setting up an easy first score for the Vikings, on a quick pass from safety/quarterback #3 Bror Ness to running back #8 Robin Bakken, a couple of plays later. Åsane responded immediately with a breakaway run from standout player #27 on the first play of their next possession, and only a shoestring tackle at the Vikings 31 yard line by #3 Bror Ness prevented a score for the Seahawks. Åsane kept moving the ball closer to the Vikings end zone, but on 2nd and long from the Vikings 20th yard line the Seahawks quarterback threw a pass intended for the right slot receiver which was intercepted by outside linebacker #47 Andreas Neråsen, who returned it to midfield. Some though running from among others #8 Robin Bakken set up a quarterback keep that #3 Bror Ness took all the way to the end zone. 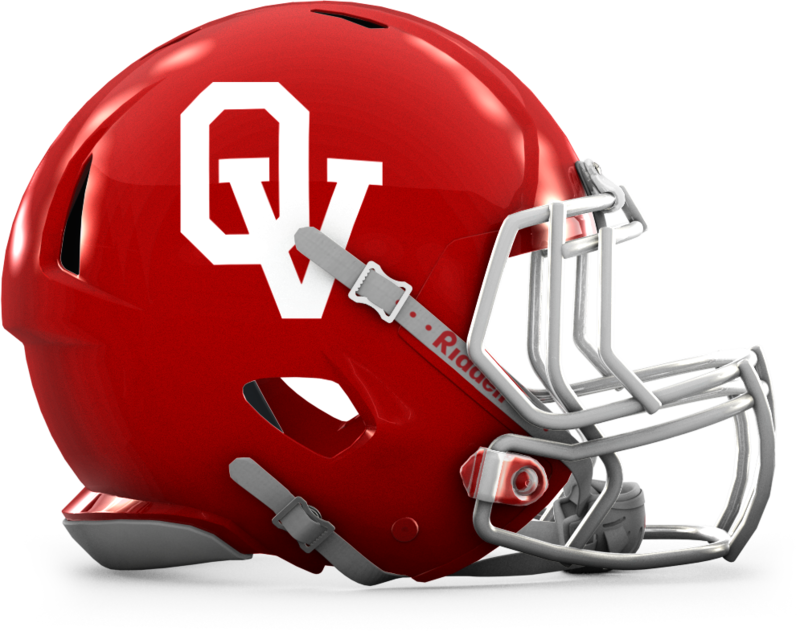 Early in the second quarter the same scenario repeated it self; hard running and passes, setting up a quarterback run by #3 Bror Ness all the way to the end zone. The Vikings were up 21 – 0 and a victory felt assured. Åsane Seahawks on the other hand was not ready to give up. Once again #27 was at the center of events. First breaking a 80 yard run from the Seahawks own 20 yard line all the way to the end zone. Then, doubling up on defense, #27 sacked the Vikings quarterback and also created pressure which lead to an Åsane Seahawks interception.This again set up the second score for #27, a 10 yard run to the end zone. Vikings were going in to half time leading 21- 12, but the Seahawks had the momentum in their favor. The second half started with the ball in the Vikings hands, and the team did not seem like they were ready to let the Seahawks properly back into the game. With, among others, catches and long runs by tight end #11 Lars-Petter Hillesund, Vikings drove the ball all the way down to the one yard line, where once again #3 Bror Ness could run the ball in to the end zone for another score. After this the Vikings were able to once again control the game. The defense played hard and forced Åsane to punt each time the saw the ball. Also the Vikings did some unpredictable changes on offense to confuse the Seahawks. In a deceptive formations, where wide receiver #5 Amund Maudal switched places with #3 Bror Ness and played quarterback, Amund Maudal was able to hit wide receiver #21 Peder Topaas on a 25 yard deep pass for one more touchdown. Åsane Seahawks were down, but not quite out, as once again #27 managed to break away on another 80 yard touchdown run, to get the score to 35 – 18. However the Vikings were not done for the day either. Once again #5 Amund Maudal was playing quarterback, and this time he hit #3 Bror Ness on a 70 yard pass play, for his fourth touchdown of the day. 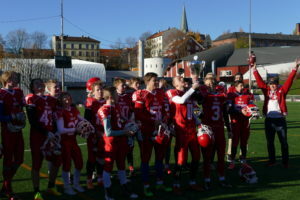 Åsane had one more drive to try and get some more points on the board, but the drive, and the game, was effectively stopped by ha huge tackle for loss by defensive end #15 Jonas Wiik Gabrielsen, setting the final score of the game at 41 – 18 to the Vikings. 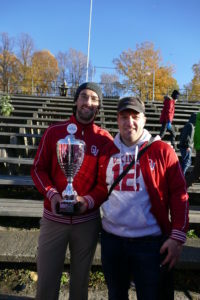 The Oslo Vikings U15 are Norwegian National Champions! It has been a great season for the team, with much improvement and solid play on all positions. Now some of the players move up to the U17 level, while other remain for one or more seasons with the U15 team.